We need the Spirit of God, the Holy Spirit, to be able to discern—to understand—things, which are spiritual. The Holy Spirit is a gift from heaven, a free gift, from God the Father and Son Jesus Christ. Every man, woman and child has been given this gift, to guide, teach, direct, and help mankind; to live and walk, in the image of God, perfect, blameless, righteous and holy. 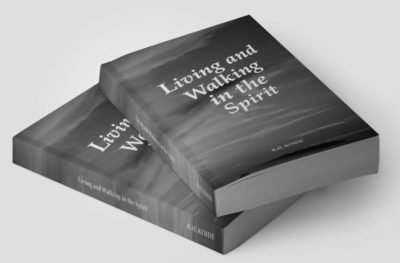 In his second publication, Living and Walking in the Spirit, author R.H. Koide has mindfully curated a selection of Bible verses (from the King James Study Bible), which he hopes and prays—through the Spirit of God—will give us a better understanding of who we are as created beings in our relationship with God, the Creator. Without the Holy Spirit providing Wisdom, knowledge and understanding about the creation of man—made with the Body, Soul, and Spirit—never in a million years would humans be able to grasp the truth of who we are as found in the Scripture—the Bible, the Word of God. Through the guidance of the Holy Spirit, let us search Scripture for the answers. Genesis 1:1-5; In the beginning God created the heaven and the earth. And the earth was without form, and void; and darkness was upon the face of the deep. And the Spirit of God (was hovering over) moved upon the face of the waters. And God said, Let there be light: and there was light. And God saw the light, that it was good: and God divided the light from darkness. And God called the light Day, and the darkness he called Night. And the evening and the morning were the first day. The Holy Spirit made the earth alive with light and water. Without light and water, the herbs, grasses, fishes, fowls, cattle, moving creatures and mankind would not be able to exist. In six days God created, made everything necessary on the earth and in heaven for mankind to live. Water, light, oxygen, food, help mate (helper companion to him), fishes, birds, moving creatures, night and day. The Spirit of God was involved in the creation of the heavens and the earth. Everything in the heavens and the earth became alive with the Spirit of Love. At the end of the sixth day, God made an assessment of His work of creation. We find in Scripture Adam, the man whom God created, was made from the dust of the ground. The physical form of the body of Adam came from dust, which is without life, dead. The blood, which is the life of the flesh, made Adam physically alive. In this body of flesh, Adam is made physically alive. Without the blood of the flesh to provide oxygen to the trillions of cells of the eyes, ears, nose, mouth, heart, lungs, kidneys, hands, feet, arms, legs, brains, none of the body parts would be able to function and remain alive. Adam is made alive physically with the body of flesh and blood. And God said, Let us make man in our image, after our likeness: So God created man in his image, in the image of God created he him; male and female created he them. God is a Spirit. God is love. God is righteous and holy. God is perfect, blameless. God is everlasting. These are a few of the characteristics of God, the Creator. God is not flesh and blood. God desired for man, Adam, to be created in His image. Adam, with the indwelling of the Holy Ghost, the Spirit of God, would remain connected to the Creator, able to love, to be righteous and holy, perfect, blameless and live forever. God created man with His Spirit of Love, the Holy Ghost, whereby Adam would love God and his wife, Eve. God gave Adam dominion, responsibility, as the caretaker of the fowls of the air, the animals of the land and other living creatures. Adam, in the Spirit of Love, abiding, remaining, resting, trusting and living by faith, loving his Creator, believing, would do as God commanded. "The Spirit of God hath made me, and the breath of the Almighty hath given me life." Luke 11:9; And I say unto you, Ask, and it shall be given you; seek, and ye shall find; knock, and it shall be opened unto you. Humans think being perfect, or that perfection, has to do with living a godly life, not sinning, not hurting others, not cheating, not stealing, not committing adultery, not killing– being good. Trying to keep the Ten Commandments, we find ourselves failing most of the time. We become discouraged; comparing ourselves with others, we realize this is impossible. We feel defeated, wanting to quit trying and giving up. Jesus knew the greatest problem mankind had when they came into this world was the way in which they loved. The only way mankind could be completely obedient was through the New Covenant, the New Testament. This is not a new law. It is a new mind! A new heart! Through Jesus Christ, in the Spirit of God, we can love God and others. Remember, Jesus said, “I am the way, the truth and the life.” In the Spirit of Love, Jesus provided the way in which mankind could love as God loved the world. Many “Christians” have been led to believe in the teachings and doctrines of the “Cleansing of the Heavenly Sanctuary.” Throughout Scripture, the Bible, word of God, there are no such teachings. Many, who are not willing to study and search for the truth, will be deceived. Because of unbelief, they reject what Jesus accomplished at the Cross and Resurrection. The “Plan of Salvation,” the fulfillment of God’s promise to Adam and Eve, to Abraham and his seed is finished. Because they do not believe, they also reject Jesus Christ and His righteousness. They do not believe in righteousness by faith. These individuals continue to live under the Old Covenant, Old Testament and Old Will. They are condemned and will be judged according to the Law of the Old Covenant, the Ten Commandments. Because they do not love God and others, they will be cut off and not allowed to enter into the heavenly kingdom.